Calling all Toppers! You have four days to make a lasting impact for our alma mater during the fourth annual RivalsUnite4Girls Annual Fund Challenge. Assumption High School, Mercy Academy, Presentation Academy, and Sacred Heart Academy will again join forces to raise funds to support the Catholic education of young women. Last year’s challenge raised nearly $243,000 with 3,432 total alumnae participating. Who will win the title this year? The school with the highest alumnae giving percentage at the end of the challenge will win the Golden Piggy Bank and a year of bragging rights! We know Toppers will rise to the challenge again and push to put us back on top! 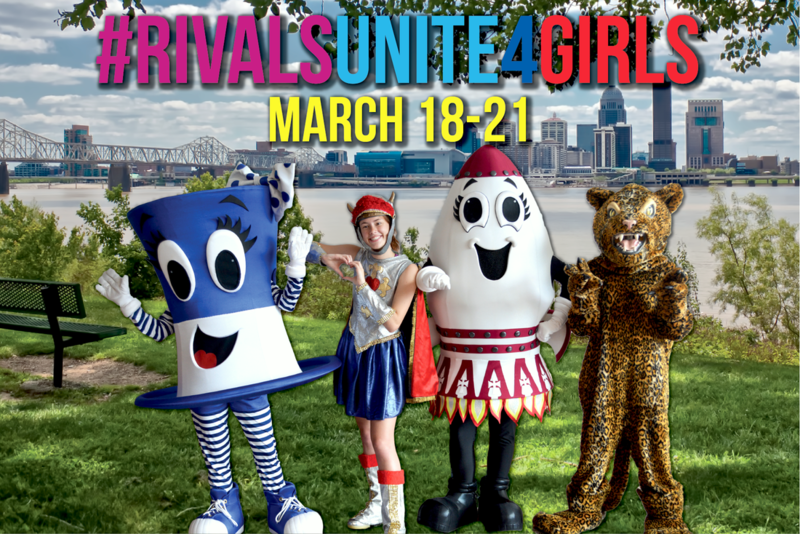 RivalsUnite4Girls is a friendly competition between the four Louisville all-girl Catholic high schools. The purpose of this initiative is twofold: to encourage women to support their alma mater with a gift to the annual fund all while providing young women the opportunity for a quality Catholic education. In the fall of 2016, representatives from the four Louisville all-girl Catholic high schools gathered together to discuss the possibility of a joint alumnae fundraising challenge. Leadership at Assumption High School, Mercy Academy, Presentation Academy and Sacred Heart Academy all agreed that this was a unique opportunity to rally alumnae support while raising awareness of providing young women with the best education possible. While each of the schools are rivals, both academically and athletically, they share a long history of graduating students prepared for college and beyond. The name of the proposed challenge quickly became clear: #RivalsUnite4Girls. During the blitz, Toppers, Rockets, Jags and Valkyries are encouraged to make a gift to their respective annual fund. The annual fund is the lifeblood of the school; supporting the operational budget and helping to bridge the gap between tuition and what it actually costs to educate a student. ​The school with the highest alumnae participation percentage at the conclusion of the challenge wins the “Golden Piggy Bank” and a year of bragging rights. While we are truly grateful for ALL alumnae support, the goal of this campaign is to increase alumnae participation to the annual fund. The annual fund supports operations including, tuition assistance, technology, salaries, etc. Donations to the annual fund are unrestricted dollars. Because we are striving to increase participation, no amount is too small. ​If you made a donation through a Tower newsletter, the annual report, responded to the annual appeal mailing, Give Local Louisville, or sent in an unrestricted donation, thank you! Your gift has been counted in our participation percentage. If you have restricted your gift or given to Tower Awards, Alumnae events, a specific scholarship, Walkathon, Pot O Gold, and/or Beyond-Major Gifts, there is still an opportunity to donate to the annual fund.